This picture is unlocated and there is no image available. Henry Gillard Glindoni was a London painter of historical and figure subjects. He was a member of the Royal Society of British Artists (RBA) from 1879 and an Associate of the Royal Watercolour Society (ARWS) from 1883. At first he worked in the theatre, helping his grandfather who was a scene painter. He also worked with various photographers, including Blanchards, colouring prints on porcelain. He studied at the Working Mens’ College and the Castle Street School of Art. 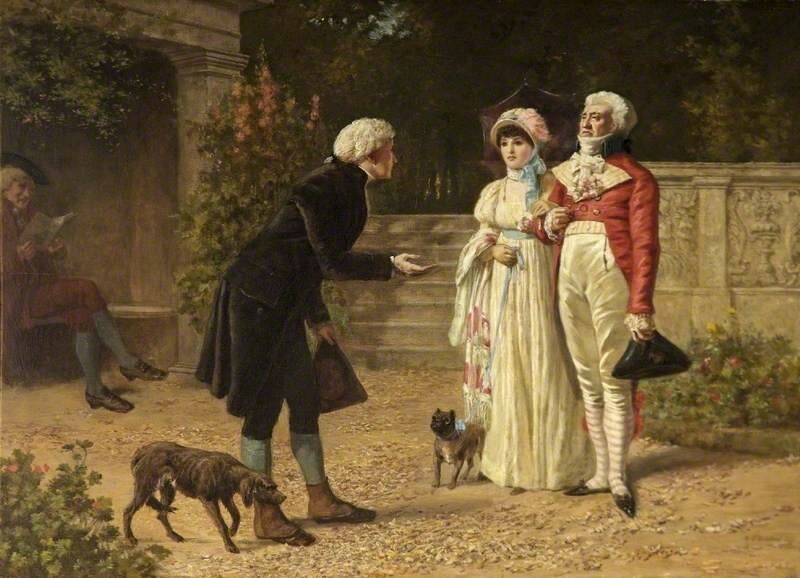 He exhibited at the Royal Academy, Royal Society of British Artists, Suffolk Street Gallery, Royal Institute of Oil Painters, Royal Society of Painter-Etchers and Engravers, Royal Society of Artists in Birmingham and the Old Watercolour Society, where his costume pieces set in the 17th and 18th centuries gained success. He settled at Chadwell Heath, near Dagenham Public Library (Wood, 1978). He is buried in Crow Lane cemetery, Romford, along with his wife Ruth. (Johnson, 1980). Below is an example of his work.